I always strive to combine beauty with form and function. If a room is gorgeous and pleasing to the eye, my clients are more inclined to keep things neat and tidy. When it comes to bookcases, most of my clients treat them as functional pieces of furniture and unimaginatively align their books upright across the shelf. Bookcases consume a significant amount of visual space, and in some cases, they are the focal point of the room. 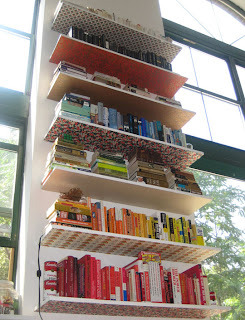 Below are some easy examples to add decorative style to your bookcases. 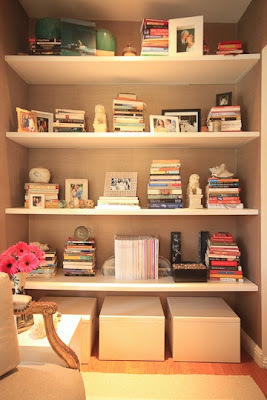 Stack books on their sides to create lifts that highlight personal treasures. The different levels across the shelves create a dynamic flow. Note the use of empty, negative space. This helps the bookcase feel light and airy. Simple boxes on the bottom are a great solution for additional storage. 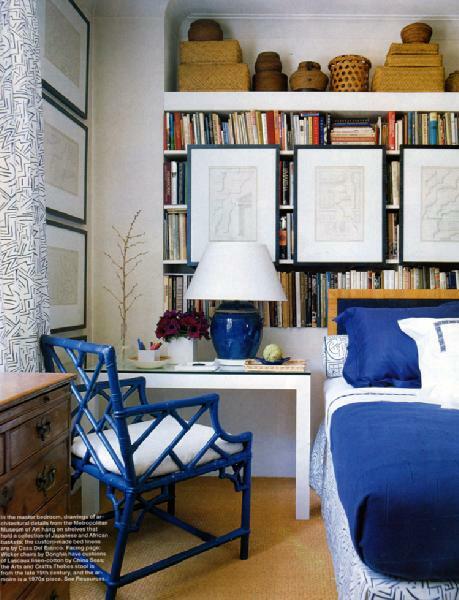 Mirror backs lighten and brighten large bookcases that would otherwise take up too much visual space. 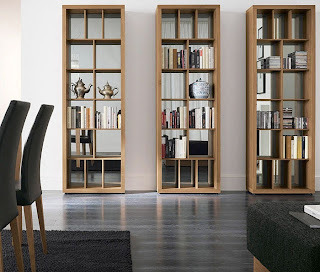 I love how mirrors add a touch of glam to these modern bookcases. Unexpected wallpaper on the bottom of floating shelves draws the eyes up to amazing ceilings in this loft. In this room, books serve as a background for art. I see this look in magazines all the but question the practicality of it. This set up only makes sense if you don't access your books frequently. 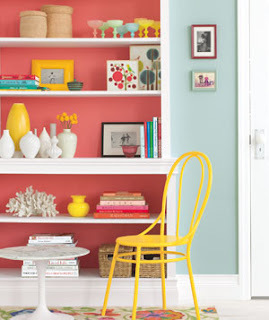 Paint the back of your bookcase to add a splash of contrasting color. 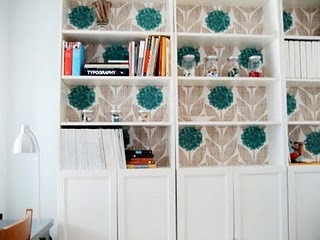 Wallpaper backs adds a touch of wimsy. The large scale of the pattern suites the large bookcases. Usually, all it takes is one roll of wallpaper. One of my favorite bloggers, I Suwanee, has a weekly feature called Bookcase of the Day that highlights mouthwatering bookcases. Lots of beautiful inspirations.